I am a long time SLR user. I am still one. Around 2005 I ventured into range finder system (rather than range finder photography, seems like I am far from it). Well, Leica is too far away for me in dollar sense, even considering buying second hand. Being a long time Rollei and Zeiss supporter, I bought myself (with whatever excuses I could think of) a Rollei 35RF and 40mm Sonnar set. Note: The camera strap adaptors shown in the photo are not original from Rollei 35 RF. My main reasons for getting into a range finder system are a few. Firstly need to find some excuses to spend my savings. Next I have been eyeing at the better performance of the wide angle lenses especially distortion control. Then I was also looking at a smaller camera system in terms of size and weight as my age is catching up, the whole battery of SLR equipment may one day be too heavy for me. Maybe for the price I paid I should have bought a Voigtlander Bessa R2 instead. 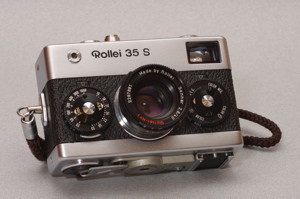 Rollei 35RF is essentially a re-badged Bessa R2, both made by Cosina. Of course the external appearance is different, but the mechanical layout are all the same. Frame selection on the 35RF is for 40mm, 50mm and 80mm. Most of the other range finder bodies offer a 35mm frame line. Range finder coupling for the 35RF is closer at 0.8m than the R2 at 0.9m. The later Bessa and the Cosina-Zeiss developed Zeiss Ikon are able to close focus to 0.7m. The 40mm Sonnar lens, however, is provision to close focus to 0.7m. I have no complaints on the 35RF body. Good metallic feel. Fully mechanical. The only thing is the shutter noise a bit loud and not very impressive :). The finder has enough space outside the 40mm frame line for me to frame for a 28mm lens, one of the main consideration when I bought my ZM 28mm Biogon rather than getting the very well praised ZM 25mm Biogon. I have been using the 35RF with the trigger winder. I have actually never use the trigger winder in its original design intent that is to take rapid shots at approximately 3 frames per second. I prefer the size of the camera+trigger winder for better gripping. My first encounter with the Zeiss 40mm Sonnar was with this ever popular Rollei 35 S. The sweetness of the colour and the high resolution apparent of the lens character already atrracted me at that time. I am a safe shooter. I will almost always taking photos at shutter speed of 1/125 or faster and use aperture setting optimum to the lens, generally 2 stops above the largest f-stop. So for practical purposes I do not face much issue with focusing accuracy with the shorter ranger finder base length. For tele lens and even 50mm at f1.4 I still much prefer using SLR, which allows me to judge the effect of depth of field. Also with SLR I do not need to focus and recompose as I use full matt screen and therefore I can focus at anywhere I like. Especially for taking kids at close range and I always like to focus on the eye nearer to the camera. If this body has flash TTL and a shutter quiet like Leica M I guess it will then be an almost ideal body, short of a longer range finder base length.